I received an email for Anke last week with a great eco friendly Christmas gift wrap idea. 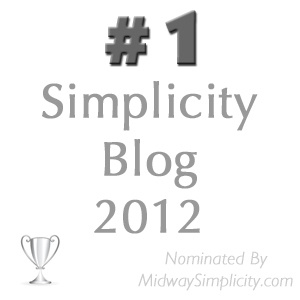 Here is what she had to say… “Last year I decluttered a lot of clothes. 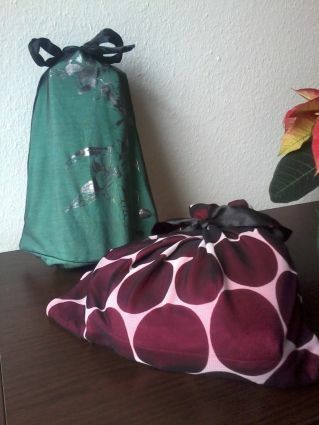 Some of them had nice prints or fabric so I sewed little bags out of them which I now use to wrap presents. Good thing is that I can use them over and over again and I think they just look different next to the other presents.” Here is the photo Anke sent me of her wonderful gift bags… How clever is Anke. She has managed to turn clutter into an eco friendly gift wrap alternative. Question: Am I in love with all the knick-knacks and thingamabobs in my home or would life be easier if I just kept the ones I really love and have less to dust? Mission: Declutter a few knick-knacks that you are tired of dusting. Good luck with that use-it-up challenge Melissa. Thanks Colleen. I think I will have to just donate some of the wrappings. I save gift bags when I receive them and though I try to use from what we have, it seems I end up with more bags coming in than I give out. I make gift tags out of last year’s Christmas cards by using a tag shaped puncher to cut out the pretty designs on the card fronts and then I write ‘To’ and ‘From’ on the tags. Because each card can make 3 or 4 gift tags, I have now accumulated more gift tags than I can use too. I don’t know if anyone would want these hand made tags. I may bring some of them into work to see if anyone can use them for their gifts this year. They all sound like great plans Melissa. I use my old Christmas cards to make next years cards and gift tags but for some reason it has never dawned on my to use my tag much to make the gift tags. Three little tags would make a nice front for a big card too. Hmmm, ideas for next year. Actually I might go up and fiddle around in the cards crafting stuff right now. Such a great idea!!! My sister does this – she has 7 kids so you can imagine the ginormous amounts of wrapping paper she used to use. One of these days I want to do this as well. What a clever sister you have. I imagine this has saved her a lot of money. The bags could also be used for all sorts of other purposes while they aren’t being used as gift wrap. I’ve hesitated every time I condidered making bags because I don’t want to store them. Maybe I can think of something to use them for without making them add clutter. Good thought! What a great idea. I will have to try this when we figure out how to use Mom’s sewing machine. Mom’s is this new things with all these stitches to pick and all these presser feet to use and who knows what all. We’ve had three people over to try to help figure it out and none can. So after the holidays we are going to go to a class. I’m not a sewer but Mom is and this thing is a real pain. We wish we had our old one back. This one was a gift. reminds me of my brother…always shows up late for the birthday party for the niece or nephew with a present unwrapped…runs to the linen closet and stuffs the gift into a pillow case…to return to mom after the kid opens it hahaha! Ha ha Sher, perhaps he is eco friendly rather than late. My kids copied Kelly and Jack Osbourne and used to wrap ours in aluminium foil. At least it is always on hand and shiny. Sher – that’s so funny – it reminds me of the year that my son realised he’d forgotten me and so jumped on his bicyle and as the only place open was the petrol station, bought me a TV Guide and bought it home and wrapped it in the paper that had just come off a gift. What a wonderful idea! Cloth bags are so much nicer and are a gift as well. Sher, your brother is a legend! As far as keeping knick knacks and thingamabobs – I would ask these questions. Do you get pleasure from dusting items and placing back on the shelf to admire? Yes , keep them, No, declutter them. Do you look at your collection and constantly think it needs cleaning? Yes, declutter them, No, keep them. Colleen made a comment about a pair of shoes she was decluttering. It was ‘I got my monies worth out of them’. How important is it to do this? For me it is very important. Hi Wendy, I agree on all points, of course. I started making fabric gift bags about three years ago. I am a quilter so I have plenty of fabric, but I also use old clothing – men’s shirts are good. I also hem fabric to make furoshiki squares. (If you are not familiar with this, simply google furoshiki and look at the images.) I make them and bags in all colours so they can be used for any occasion. I think they look great. I tell the recipients if they don’t want to keep and reuse them, to return them to me. They mostly do keep the bags and return the furoshiki to me. It saves all that paper – and all those trees! Like Melissa I also cut up old Christmas cards for tags, rip fabric strips for ribbons and reuse gift bags. I enjoy using my imagination and making a gift look different to the norm. If you get stuck for ideas ask your friends Mr Google or Mrs Pinterest! Any excess gift bags, tags, etc I donate to our local op shop. Someone mentioned furoshiki squares once a long time ago here at 365 Less Things. I think they are a great idea. I love that you tell the recipient to return these to you should they not want them. Many people wouldn’t do this but I think it makes great sense. At my bridal shower, I receieved several gifts wrapped in sewn bags or wrapped in cloth and tied with ribbon. I loved it! I especially like the idea of having squares of fabric to wrap boxed items- then tied with ribbon. It is nice to know that people are doing this. And then the joy of being able to use them for someone else. I have a collection of ‘promise cheque’ booklet – all from my kids thru the years, which I have never redeemed. It occurred to me the other day I probably should probably cash them in, especially when they are too ‘busy’ to pitch in with chores. Oh yes, I would definitely use those. The kids will be so shocked to you are going to hold them to it. It should be good for a laugh.